SALT LAKE CITY (AP) Minnesota has turned into an offensive machine. Facing a Utah team without its best defensive player made it much easier to keep the engine running full speed. Karl-Anthony Towns had 24 points and 13 rebounds as the Timberwolves beat the Jazz 109-98 on Monday night, setting a team record by scoring at least 100 points for the 12th consecutive game. Towns credited his team with setting the right tone on defense to keep the offense moving. The Timberwolves forced the Jazz to the outside and didn’t give up much there until the game was out of reach in the fourth quarter. Jimmy Butler added 21 points and 10 assists, and Jeff Teague scored 22 for the Timberwolves. Taj Gibson had 15 points and 10 rebounds. Minnesota (8-5) snapped a two-game skid after shooting 52.1 percent (37 of 71) from the field. Donovan Mitchell scored 24 points and Rodney Hood added 16 to lead the Jazz (6-8), who lost for the fourth time in their last five home games and fell to 1-1 without injured center Rudy Gobert. Utah fell behind 33-14 heading into the second quarter after struggling to get stops in the paint or get on track offensively. Towns slammed down a pair of dunks to help Minnesota take its first double-digit lead at 13-3. His teammates took turns slashing to the rim for layups to keep the foot firmly planted on the gas pedal. The Jazz couldn’t find an answer, going just 6 of 21 from the field in the first quarter. Their shooting improved in the second, when consecutive 3-pointers from Hood and a banked floater from Thabo Sefolosha allowed Utah to cut Minnesota’s lead to 54-42 in the final minute before halftime. Things turned sour for the Jazz again after the break. Their defensive troubles resurfaced in the third quarter as Minnesota shot 11 of 16 and hit all four 3s it attempted. The Timberwolves led by 26 in the quarter, going up 86-60 after Gibson dunked the ball and Butler drained a pull-up jumper on back-to-back possessions. Utah made a charge late in the fourth and cut the deficit to 105-94 on a 3-pointer from Mitchell with 2:32 left. 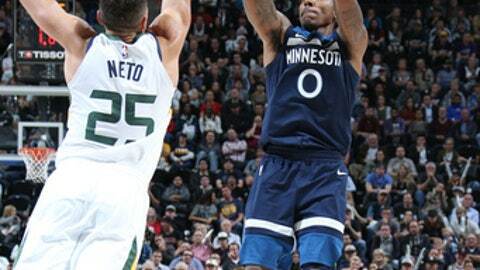 Timberwolves: Attempted 29 free throws while limiting Utah to 11. … Gibson has four double-doubles in six November starts. He’s averaging 12.7 points and 10.0 rebounds during that stretch. … Minnesota had a 40-31 edge on the glass. Jazz: F Jonas Jerebko made his first start this season and totaled 13 points and six rebounds in 25 minutes. … Hood shot 50 percent from 3-point range for the second straight game, going 3 of 6 from long distance. … Utah finished with a 49-16 advantage in bench points. Towns joined Dwight Howard as the only NBA players to compile 3,000 points and 2,000 rebounds before age 22. Towns is averaging 21.2 points and 11.2 rebounds per game. He ranks in the top 20 among NBA players in scoring and in the top 10 in rebounding. If he has his way, he’ll be making this sort of impact for a long time. In a few games, Ricky Rubio has gone from Utah’s leading scorer to an offensive liability. Rubio can’t get his shot to fall. He’s shooting 31.8 percent from the field in November after going 1 for 7 against Minnesota in 22 minutes. Jazz coach Quin Snyder said he doesn’t want to dwell too much on Rubio’s shot selection. What he expects to see from Rubio are other essential qualities for a point guard. Timberwolves: Host the Spurs on Wednesday. San Antonio will be on the second leg of back-to-back road games after facing the Dallas Mavericks on Tuesday. Jazz: Begin a four-game road trip Wednesday against the New York Knicks.